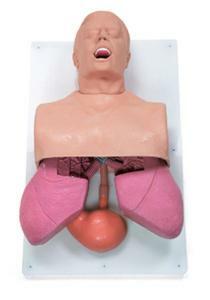 Detailed anatomy featured on the adult intubation trainer stands out. Get a clear picture of human anatomy from the sculpted alveolar sac, bronchial tree, and blood vessel structures of the cross sectioned and exposed flexible lungs, to the interior main bronchus and oral/nasal pharyngeal spaces. Combine these details with an airway complicated by breakout teeth, tongue edema, and laryngospasm, and this airway trainer rates hard. An anatomical stomach that swells with esophageal intubation, or excessive pressure with the BVM during rescue breathing, together with the vomiting capability of this manikin makes this an exceptional educational tool for multitasking. Delivery with instructions for use, soft carry bag, lubricant, and replaceable lungs and stomach.